This is my first post featuring topper wigs since starting AskChavi in 2010. Toppers go by many names: kippa fall, half fall, integration piece, closure. This is a "Clip-In" topper (because it has clips) as opposed to a bonded topper (which would be glued in). 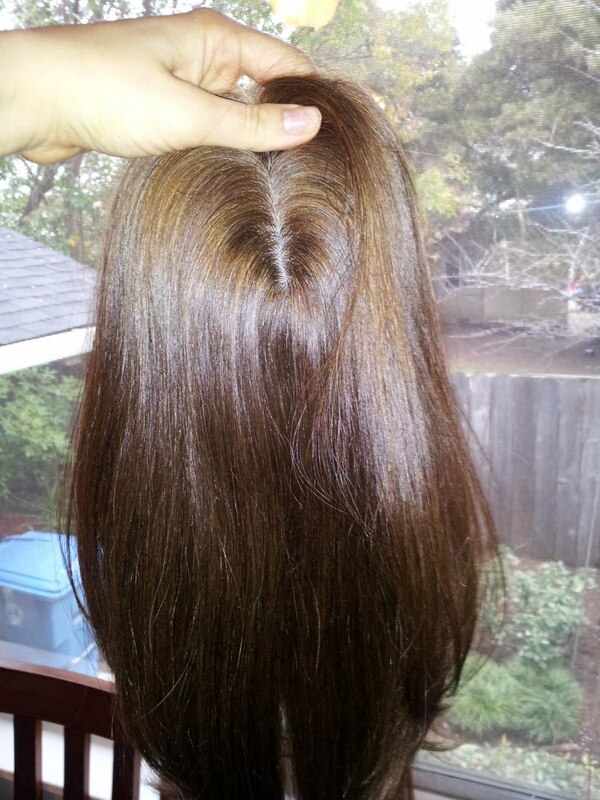 Toppers and Wiglets are popular pieces for women who suffer from Alopecia (medial hair loss) because often their hair loss can be partial, and looks like thinness or balding, and hence a full wig is not needed. Toppers are lighter and more comfortable than full wigs because they contain less hair, and because they do not stretch over the entire head. Kippa Falls (as they are referred to in the Orthodox Jewish Community because the cap is the size of a kippa or yarmukle) are also becoming popular in the Modern Orthodox Jewish community. Many MO women are committed to always covering their head, whether with a hat or scarf. Wearing a topper or sheitel or band fall satisfies the requirement to cover their head and also allows them to blend into professional environments or formal social occasions where hats or other head wear are not common or socially normal. Some Orthodox women only cover their hair at synagogue, so a topper is a less intense way of wearing a wig that still covers as much or more as they would cover with a hat, scarf, doily, etc. A caveat with toppers: they will take more time to put on because they must integrate with your real hair. Its ideal to have a topper the same color and texture as your hair and that it is cut in a way that meshes with your own hair length and style. For example, my hair is really wavy and frizzy and currently dark blonde, so it looked a little silly when I threw perfectly sleek brown hair over it (as seen in the pics). However, when done right they can look COMPLETELY natural, and I think its much lighter and more comfortable and should be considered as an option for women who suffer from painful wig headaches. SavvySheitels.com let me borrow a topper to review. They manufacture Aura Wigs. This is a light brown European Hair piece which I believe has its cuticles intact based on the feel and sound of the hair when I rubbed it. There is no color number but it is close to my 6/8/10 wig. The hair feels very sleek, did not knot the entire time I handled it, and the skin top looks very realistic. There is variation in the hair color, so it looks like a natural shade. It is neither ashy or very warm, but a medium toned light brown. Savvy Sheitels is offering $150 discount on all custom pieces over $700 (to AskChavi readers!). The toppers can be viewed here - You just have to enter the code TOP150 at checkout. This piece shown is available for sale as well. I am just borrowing it in order to make this review. They can manufacture a custom piece to match your hair color and texture, which I recommend highly when it comes to wearing toppers.